 Can Jaitley turn around BJP's fortunes in Gujarat? In 1989, when freedom fighter Iswarbhai Chawda lost an election for the first time in three decades from Borsad region of Gujarat -- it shocked everyone. He was the leading political and social force of the Kshatriya-Rajput community against the prosperous and highly vocal Patels in and around Anand district. Such was the complete hold of Chawda and his son-in-law and former chief minister Madhavsinh Solanki in some five to six constituencies in Anand that voters would vote for anybody Chawda recommended. But that was a different time and Chief Minister Narendra Modi was not around in Gujarat politics. 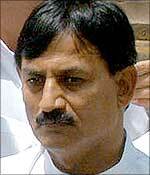 His grandson Bharatsinh Solanki, 54, is all set to fight a battle royale against Modi in the assembly election to be held at the end of the year. Solanki, as president of the Gujarat Congress, is traveling to every nook and corner of the state to try and re-energise the badly-demoralised organisational structure of the party. Modi is just two years older than him but many miles ahead in political experience. Congressmen and secularists in from Gandhinagar to New Delhi are watching if this civil engineer can stop Modi's juggernaut. Modi is a born politician, while Solanki is a reluctant one. The senior Solanki was a practitioner of famous KHAM theory of Gujarat which helped Congress monopolise the votes of the Kshatriyas, Dalits, tribals and Muslims. The combination ignored the Patel community who eventually gravitated towards the Bharatiya Janata Party. Shall we start with a debate on the Patels? How do you look at the community's political power in Gandhinagar? In last 100 years, the Patels of Gujarat have grown very fast. Behind it is their entrepreneurship, unity, focus and hard work. Even after Sardar Patel they were lucky to have many leaders who have guided them to succeed in all sectors of life. The Patels are flexible by nature. If they accept you then you can get anything done from them but their displeasure is also difficult to bear. I take this as a positive sign. Your father practiced the KHAM theory. It was social engineering that won many elections for the Congress. But the Patels got isolated and the Solanki family was considered 'anti-Patel'. It was the Patels' political, economical and social power the helped the BJP to power in Gandhinagar. Today, the same Patel leaders are disenchanted with the BJP and Modi. Their support looks shaken and uncertain. I think it is your misunderstanding when you say that KHAM was my father's brainchild. It was thought about by Congress leaders like Jeenabhai Darjee and (former finance minister) Sanat Mehta. They got various communities under an umbrella but the common factor was that they were all poor. In essence, poor people were with the Congress and they trusted the Congress. Before Independence, Sardar Patel brought Patels into the Congress fold and they along with Sardar participated in the freedom movement. But a large section of the Patels moved towards the old Congress (known in Gujarat as Sanstha Congress) when the Congress got divided. In Gujarat, the middle class and upper middle class constituted largely Patidars (Patels), Jains and traders. You are right that the Patels got alienated from Congress at that time. As a result, Chimanbhai Patel and the BJP took advantage. But the reference to context has changed. Patels are leading Gujarat and they, always, walk with time. They are a flexible people. Patels, who once strengthened BJP in a big way, are looking towards Congress, once again, because they feel the Congress will help in globalisation. The Patels are itching to contribute to India's globalisation. In my first press-conference a journalist asked me do you believe in KHAM theory or not? I said I believe in aam theory. (referring to the common man). We want to carry along with us, the poor and middle class. After my nomination as state president, the maximum number of district presidents in the Congress are Patels. Before my nomination all kinds of ill-founded fears were there but now, they have seen my style and are re-joining the Congress in big numbers. What could be the reasons of their disenchantment with BJP? In a society which grows fast, priorities also change fast. They are everywhere in Gujarat; take politics, sports, music, trade or profession. Now, they want to dominate. They want political leadership again. When Keshubhai Patel was removed from the chief ministership some people thought that it had some Hindutva dimension. But when Modi came, the Patels' political participation, economic growth and leadership got reduced. The Patels were neglected. They thought since Keshubhai Patel was removed by Modi, let us remove Modi. But they are also looking at an alternative. The Patels original home is the Congress; they contributed in making of the Congress in Gujarat. You have been president for 18 months. How do you review your performance? The grassroots workers of Congress were disappointed with the party. They wanted hope. We started a training programme for youth. We said we don't want leaders. We want "sathi, mitra, bhai" (companion, friend and brother). We gave training to Congress workers and made them skilled. We told them about the Congress, its leaders, secularism and its importance. We told them about time management and concepts of team building. We arranged training camps in all big districts and seven cities. Urban and rural areas have different issues on hand, we also took OBC, Dalits, youth and women separately. We used to call doctors, psychiatrists and experts in various fields to tell them about BJP, the United Progressive Alliance government at the Centre, laws and current affairs. We decided to reach every village of Gujarat. There is not a single village left here where we haven't put the 'Hand' (Congress symbol) mark and Soniaji's picture. When Modi relaxed the prohibition policy we put graffiti all over Gujarat quoting Gandhiji that "alcohol is an invention of Satan". No need to guess who is Satan today! We quoted Sardar Patel for communal harmony. Unity is a must for peace and prosperity in Gujarat. Do you really think such training camps can rejuvenate the Congress and get votes? That's a tale of the past. It's history. You have no idea that how my workers hoot him out in some areas. Shall we talk about Modi? Modi is a small man. Let us not talk too much about him. Many experts and surveys say that he is the most popular leader of Gujarat even now. You know better about surveys. From villages to cities our surveys tell a different story. His policies and programmes are rejected and getting him nowhere. He is using people's money and people are watching it, quietly. Is he a popular leader or not? Not at all. He is a hypocrite. He is showing off. He is putting up posters because he has nothing else to show. Even in media surveys his ratings have plummeted. In Rajkot, he won only by 14,000 votes. He is the weakest CM by that yardstick. The BJP got success in local bodies elections where merely 38 percent voted. Event, Modi tried to disassociate himself by reminding people that this is not an assembly election this is an election for roads and gutters. He was scared of losing. You have declared a war against his government. What do you think are his weaknesses? Arrogance. Arrogance means Astaya - untruth. It will be responsible for his fall. He thinks that what he says and believes is the truth. This belief has driven him away from the truth and the people. We are not saying these things. BJP leader Keshubhai Patel is saying it. Real information is not reaching him at all. He is surrounded by chamchas. Some ten years back we used to hear that 'Madhavsinh's son is a bully'. Do you think your image has changed since then? Some people may say all sorts of things. I have goodwill of my team and people trust me. In last Lok Sabha election, I got overwhelming response. I agree it is just one constituency out of 26 in Gujarat. I am hopeful that Gujarat will trust me. Will you agree that Modi's image is of a non-corrupt politician? He started corruption with the Sujalam Suflam water project. The issue is that Modi indulges in corruption at higher levels and takes huge bribes and doesn't get involved in small amounts. It is plain to see how he favoured five industrialists and awarded them huge plots of land. The public knows how politicians use industrialists and run political parties. Modi is giving rich people tax concessions, cheap land and water to enhance his image. He has put up hoardings worth crores of rupees. Even, India's prime minister does not have as many hoardings. He wears some fancy dresses, headgear and shawls and then poses for hoardings. The fact is that the chief minister uses money in enhancing his image. He uses it to eliminate his opponents. Also just wait when we reopen the Haren Pandya case (Pandya was a BJP MLA who was killed in Ahmedabad). Everything was manipulated when it was investigated but the truth will come out one day. We are also opposing the Godhra trial. After Godhra, the riots followed. The state chief minister was the 'mukhya sutradhar' of the Gujarat riots. Even the truth in the Akshardham massacre will come out after Modi falls. We were talking about corruption in Modi's government. It was also alleged that two big industrial houses benefited when the Congress was in power in Gujarat. At that time Gujarat needed employment away from agriculture. Look, how the Congress helped improve growth and income. Modi can claim that too. Gujarat has a higher growth rate than India. Read carefully. The growth of Gujarat is only because of petroleum products and agriculture, but it has not created new employment. Modi speaks lies, loudly and repeatedly. So you people are impressed. Modi is running out of confidence. He is following our agenda and copying our programmes. A large section of Gujarati voters think that the Congress has an in-built tendency to appease Muslims. But during the riots in 2002, Congress leader Amarsinh Chaudhary adopted a soft-Hindutva approach. You are ending up displeasing both the secular and non-secular voters. The Congress is secular and will remain secular. The Patels are shifting to the Congress to unite Gujaratis. The rejection of Modi will be bigger than rejection of J Jayalalitha or Chandrababu Naidu [Images]. People will see the magic of Gujarati voters. Are you taking any advice from your famous father? We do not meet quite often. But he always advises me to listen more. We the young people in the Congress are rejuvenating the party. It is a difficult role. After winning election in 1985 we haven't won any election in Gujarat on our own strength. We are rebuilding the Congress culture in Gujarat.